Red Button & Online: Weds 27 June (15:50-18:45 BST), Thurs 28 (15:15-18:00), Fri 29 (16:00-20:35) and Sat 30 (17:00-20:35); BBC Two & Online: Sun 1 July (14:00-18:00). UK Athletics head coach Charles van Commenee says this week's European Championships is primarily for athletes to attain Olympic qualification as opposed to podium places. Two years ago, Britain won a record 19 medals at the Euros in Barcelona. Van Commenee said it was unlikely this tally would be beaten by an 82-strong squad in Finland made up mainly of those yet to qualify for London 2012. "Test yourself or select yourself," is the message from the 54-year-old. "I always said this was to be seen in the light of preparation for the Games," said Van Commenee. "It was never a purpose to select the best possible team to get a great number of medals. "I am sure we will not get the same number as Barcelona because we did travel there with the best possible team. It's about preparing the team as well as possible for a home Games. "Here we have a few final selections to deal with. There are some head-to-heads, some athletes need a good performance to be selectable. For some it's also a really good test to see if they can perform in a championship. "We have some very good athletes like Robbie Grabarz [high jump] and Lawrence Okoye [discus] who are in the Olympics, but have never been at this sort of competition so that serves a purpose in that area. "I have approached this championship very much from an individual interest per athlete." 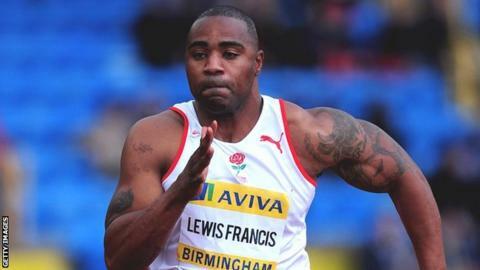 Track athletes who gained automatic Olympic places at the weekend's trials in Birmingham have been de-selected from the initial 109-member team. In addition, those in a strong position to be handed a discretionary place - including controversial sprinter Dwain Chambers (who will compete in the 4x100m) - have accepted the option not to chase a qualifying time which would guarantee their Olympic place ahead of Sunday's deadline. However, Mo Farah will defend his 5,000 metres title in Helsinki on Wednesday evening. Farah won two golds in Barcelona in 2010, while the likes of Jessica Ennis, Dai Greene and Andy Turner were also victorious. Also competing in the 100m in Helsinki this week will be Northern Irish visually-impaired sprinter Jason Smyth who is hoping to qualify for both the Olympics and Paralympics. The double Paralympic champion needs to beat the 10.18-second standard to reach the Olympics. His best time this year is 10.22 but he has run 10.17 wind-assisted.